For those who are from Missouri there are two Mimis Café location in this state, this is located in Chesterfield Airport road in Chesterfield and the other one is in Zona Rosa Prairie View Drive in Kansas City. Both of these locations will accept this Mimis Café printable coupon for a buy one get one deal on any breakfast deal. To be sure that you are have a good table you must call ahead to get a reservation. You just have to give them a call and give your time of arrival and if it’s a busy time you will have to be on the waiting list. 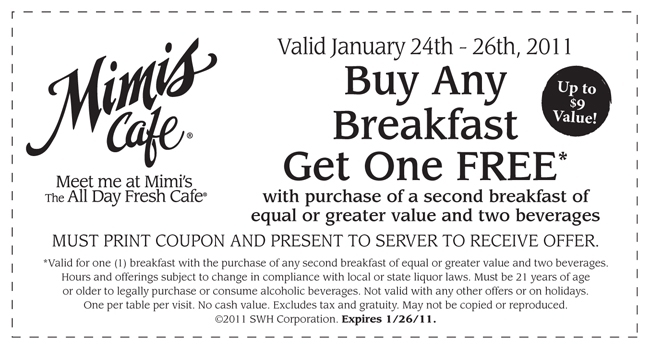 This Mimis Cafe printable coupon will expire on January 26, 2011 valid for buy one get one deal on breakfast.